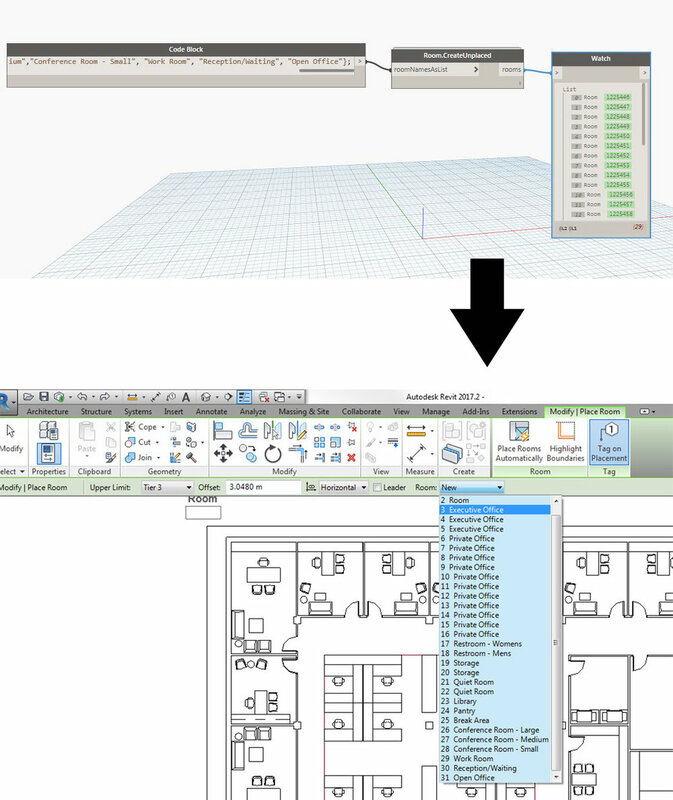 For those of you that follow my interests (and my blogs), you know that I promised to embark on a more technical walk through of how to utilize Dynamo in order to make architects' and designers' lives a little easier. If you haven't read my last blog post, you can do so here (Diving into Dynamo). For demonstration purposes, I put together a hypothetical office building. This was taken and edited from existing projects. My intention was to use a believable layout with a realistic program. I went ahead and planned out a list of spaces to import into Revit. A simple Dynamo script (I used elements from the BVN package) can easily take a list of rooms either in a code block (demonstrated below) or by importing an Excel file. I chose a code block because my list of rooms was relatively short. After placing the rooms in their general location in my Revit model, I’m left with a somewhat messy layout. I’d like to clean it up a bit using the “Room.CentreLocation” Dynamo script. As you can see, this script allows me to clean up my rooms with just a click of a button. This task, depending on the size of the project, could take anywhere from five minutes to one hour. I saved the best for last. I think most architects and designers would agree that renumbering rooms in Revit can be an excruciatingly slow process. Dynamo can help with that! By utilizing this script, I am able to reference a model line as a spline and draw the order that I want the rooms to be in, as well as the numbering prefix that makes sense for the project and conforms to your office standards. These steps may seem very trivial at a glance, but they can certainly shave off a significant amount of time. Of course I don’t have to explain to you how time is our most precious resource.